This year’s 2018-19 National Hockey League will mark it’s 102nd season for the League since being founded in 1917. As the premier professional league in ice hockey, the season is contested by 31 of the best teams from the Eastern Conference and Western Conference through a 26-week regular season. After which, the best 8 teams will then advance to the playoffs to compete through a single-elimination tournament, all for a chance at this season’s prestigious Stanley Cup. 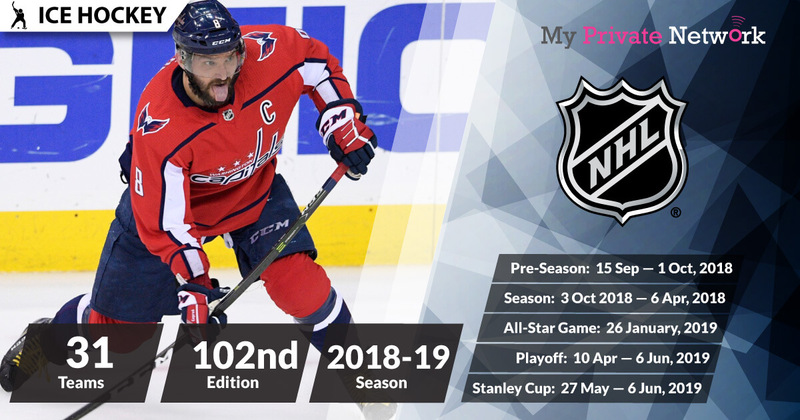 The NHL’s 110-game Preseason has already started since 15 September and will conclude on 1 October 2018. 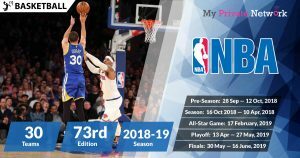 As usual, this is just a precursor to the main 1,271-game Regular Season commencing on 3 October 2018 and finally kicking off with the Playoffs on 10 April, 2019. With the best teams from the Eastern Conference and Western Conference, the Stanley Cup (2019) will be the final showdown of the NHL season on 27 May, 2019. The providers in this list with links have been tested to work with our VPN. Click on any that you prefer to quickly access streaming instructions. For other providers, please find the full list of NHL official broadcasters here. If you’re not currently in your local country of U.S, U.K, Australia, Brazil, Canada, Finland, France, Norway, Portugal, or Sweden then you’ll need to connect to our VPN first before streaming the matches from your usual providers. 2) Install our VPN on any device that you’ll be using to watch the 2018-19 NHL. 3) Connect to the VPN country of your favorite provider. For example, connect to our U.K (GBR) servers for Premier Sports. Live stream 15 exclusive NHL matches per week this season from Premier Sports (Preseason unavailable). However, you’ll need a paid subscription with them to access their content. Availability: U.K only – Connect to our U.K (GBR) servers first before starting the stream! 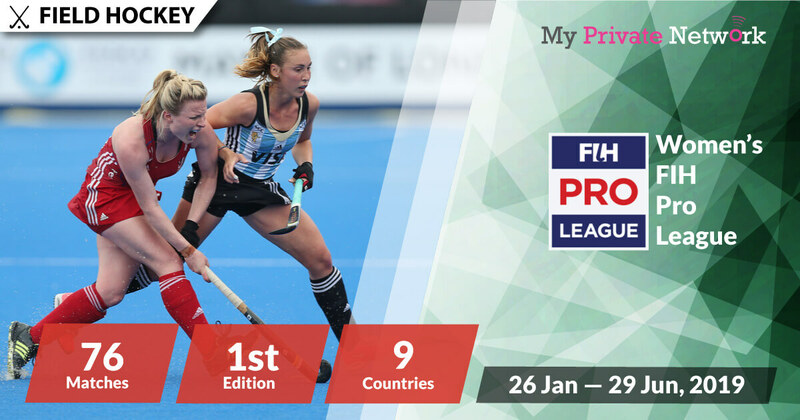 Tip: NHL will be airing live from 3 October 2018 on Premier Player HD. NBC Sports will be providing full live coverage of the entire season. However, you’ll need a paid subscription with them to access their content. Availability: U.S only – Connect to our U.S (USA) servers first before starting the stream! Tip: NHL will be airing live from 3 October on NBC Sports. Fox Sports will be providing full live coverage of the entire season. However, you’ll need a paid subscription with them to access their content. Availability: Australia only – Connect to our Australia (AUS) servers first before starting the stream! Tip: NHL will be airing live from 3 October on Fox Sports. ESPN will be providing full live coverage of the entire season. However, you’ll need a paid subscription with them to access their content. Availability: Brazil only – Connect to our Brazil (BRA) servers first before starting the stream! Tip: NHL will be airing live from 3 October 2018 on WatchESPN. Sportsnet will be providing full live coverage of the entire season. However, you’ll need a paid subscription with them to access their content. Availability: Canada only – Connect to our Canada (CAN) servers first before starting the stream! Tip: NHL will be airing live from 3 October 2018 on Sportsnet Ontario, Sportsnet Pacific, Sportsnet West, and Sportsnet East. Viaplay will be providing full live coverage of the entire season. However, you’ll need a paid subscription with Viaplay to access their content. Availability: Finland, Norway, and Sweden only – Connect to our Finland (FIN), Norway (NOR), or Sweden (SWE) servers first before starting the stream! 1) Sign in to your Viaplay Finland, Viaplay Sweden, or Viaplay Sweden account or download the Viaplay app on iOS or Android. Canal+ will be providing full live coverage of the entire season. However, you’ll need a paid subscription with Canal+ to access their content. Availability: France only – Connect to our France (FRA) servers first before starting the stream! Sport TV will be providing full live coverage of the entire season. However, you’ll need a paid subscription with them to access their content. Availability: Portugal only – Connect to our Portugal (PRT) servers first before starting the stream! 1) Sign in to your Sport TV account. Stream all 1,271 live NHL games this season with your U.S/Canada NHL.TV account. Follow this guide if you’re trying to bypass blackout restrictions when streaming within the U.S/Canada. 1) Ensure that your VPN connection is to a country closest to the U.S or Canada. For example, Mexico (MEX) or Brazil (BRA) is a good choice for their close proximity. This is to ensure that your internet speed is not affected by the longer distances the VPN connection has to travel. 2) Sign in to your U.S NHL account or Canada NHL Rogers account. 3) Search for the live stream and start watching the games! Tip: NHL will be airing live from 15 September 2018 on NHL.TV. Stream all 1,271 live NHL games this season with the international and cheapest version of NHL.TV. If you’re currently a U.S NHL.TV subscriber, unfortunately the $139 version you purchased isn’t the cheapest you could get. The full International version of NHL.TV allows access to all games at only $119. Additionally, NHL has decided to offer four FREE games a week this season. Check out the FREE games schedule here and head to the NHL.TV site to experience NHL action to its fullest. 1) Firstly, follow our simple hack for NHL.TV to bypass blackouts and purchase the cheapest version internationally. 2) Once you’ve successfully gained access to the International NHL.TV, Sign in from the top-right corner of the NHL.com page. There is no need to create an NHL account to access the free streams, they are available freely to everyone. Simply click on the stream when the game is about to start. We hope you found this article informative and useful. Please feel free to share it with your friends or family that want to watch this season’s NHL too!